Pho. Is. The. Best. Ever. The only thing is I always feel too full of sodium afterward because I do my best to not leave a drop of that delicious broth behind. So in my quest to be healthier about things and knowing exactly what’s in my food, I decided to try to make my own broth. Then I read a bunch of different recipes and they’re all just slightly different. Different enough to make me second guess everything. Plus they sound really involved. I just want easy pho broth and I’m lazy. Isn’t there a way to make that happen? If you’re willing to cut some corners and not end up with perfectly clear beef broth, then be my guest and follow my haphazard method outlined below. I will tell you what I’m doing wrong though so you can make this the right way if you’re so inclined. I’m more into hitting the right flavor profile than clear broth. I also feel terrible that I can never remember the real name for the kind of pho I make, but then I drink the broth and forget about it. I can’t stress it enough that it’s REALLY HELPFUL to have a store with a real butcher there, especially if it’s at an Asian market in this case. I can never remember which cuts to get, but if I explain to them what I’m doing, they’re pretty helpful. Plus, they’ll cut everything up for me right there so all I have to do is dump the meat in the pot. Some recipes will tell you to get a blend of different boney cuts of beef to make a very rich stock, but I think I usually get a 3 pound cut of shank and ask them to cut it up for me on the saw. Then I get them to pre-slice that chuck or sirloin for me so I don’t have to do it at home. If you want to try your hand it yourself, slightly freeze the meat to make it easier to slice. Set the thin sliced stuff aside in the fridge until the end though ’cause we’re only working with that boney stuff for now. Get your boney cuts of beef into a large stock pot and cover by at least 1-inch of water and get that pot boiling. Do this for about 3 minutes, drain the bones and transfer the beef to a clean pot or clean the one you were using. This cleans the bones and reduces that amount of muck to skim off later. Meanwhile, put the onions and the ginger under the broiler until they’re charred. Remove the charred bits and bruise the ginger with the handle of a knife. Of you can cheat and get all this going in a second pot with some oil. You would transfer the par-boiled bones and meat to this pot and finish off making the stock in this pot. Now get those par-boiled bones and meat into some water in that large stock pot with the onions and ginger. Put a lot of water in there. 6 quarts sounds like a reasonable amount. Maybe more. Just cover that meat with a lot of water. Do it. Make a spice packet with all those whole spices and throw that in the pot too with some salt. Get it on the stove and bring it up to a boil. Once it reaches a boil, reduce the heat and let that pot simmer for as long as you’ve got. Budget at least 2 hours, but if you have 6-8 to spare, all the better in my opinion. I recommend making broth on a marathon video game day, by the way. Remember to check your pot periodically. Skim off any of that scum that might show up from the bones as you go if you can. Never let your water come back up to a full boil after that initial boil if you want your stock to really remain clear. I often get distracted by the video game I’m playing so my stock doesn’t end up clear. But yeah, that’s where I go wrong. Once your broth is done, strain the whole thing to get all that stuff out of the broth. The onions and ginger you cooked with can be tossed. Pick apart that tender beef for more meat to reserve for dishing up. Give your dog the bones or keep the marrow for yourself if you’re in to that sort of thing. If you’re super serious, strain your broth through a cheesecloth lined fine mesh sieve into another stock pot. Add in the fish sauce and the whites of the green onions. At this point, bring your stock back up almost to a boil. You want it hot enough to cook that thin sliced beef you set aside, remember? In another pot, get some water boiling to throw those rice noodle into. Soak the rice noodles for about 10 minutes or until tender. 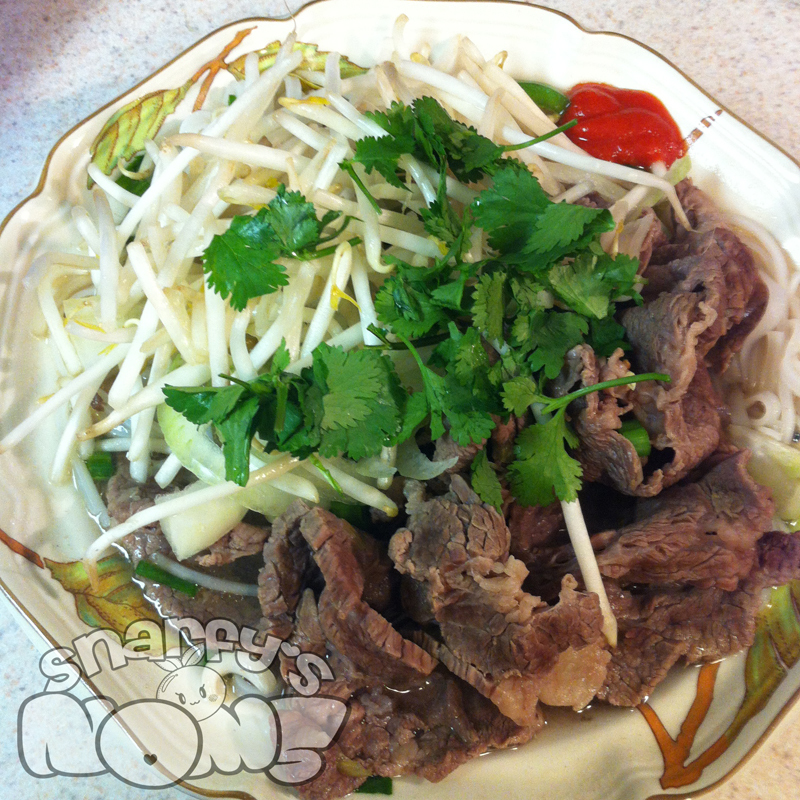 Distribute the noodles among your bowls and add a few slices of that thin sliced beef to each bowl. You can garnish at this point too with the remaining ingredients, or you can add the broth first then garnish. Whatever you prefer. Once your bowl of pho is garnished the way you like, eat it up!